Premium Spirulina by Dr. Alexander Michalzik M.D. is produced from organic Arthrospira plantensis. By means of a special process, the tablets are produced without additives and then filled into a high-quality violet glass to protect them from degrading due to light. Our product contains a particularly high content of proteins, chlorophyll and carotenoids. Spirulina Premium by Dr. Michalzik is subject to strict examinations of German supervisory authorities. It is manufactured by use of gentle production technologies without heat or additives and without the use of processing agents which are not required to be mentioned on the packaging. 2 tablets three times a day with sufficient liquids or as advised by your physician. 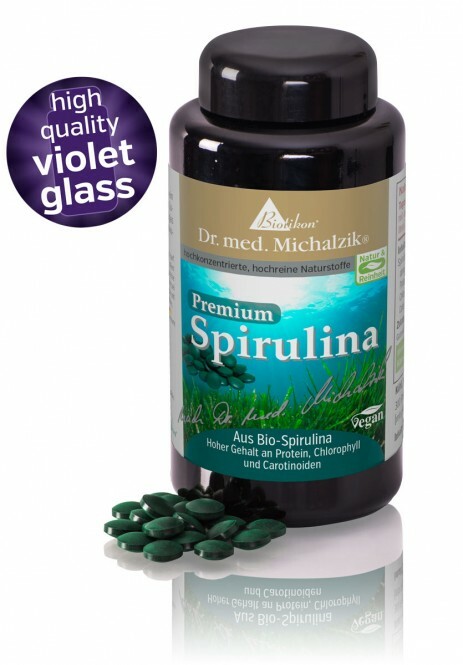 300 tablets, each tablet contains 400 mg of organic spirulina extract.